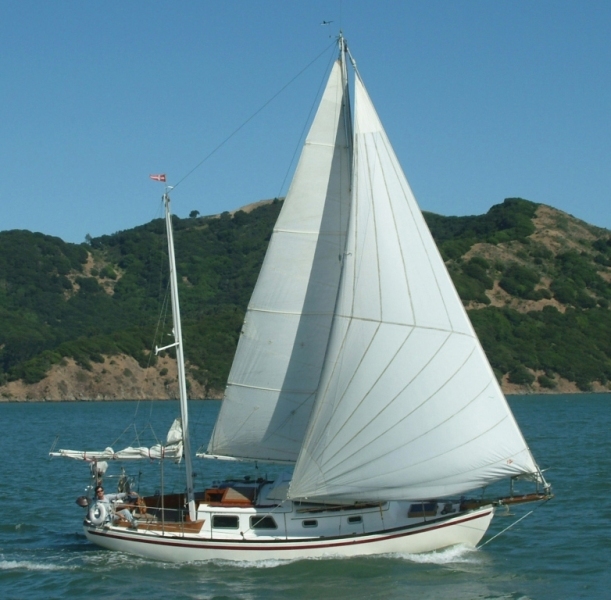 I bought Murre in 2001 and spent many summer weekends, and even some work nights, sailing her to the far corners of the San Francisco Bay. 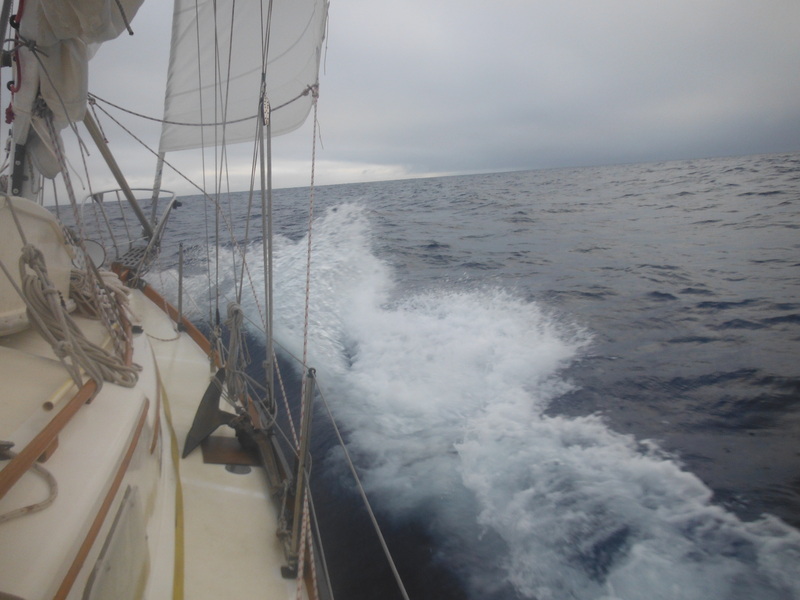 For years, the favorite activity of my wife and I was to high-tail it to Murre on a Friday evening and be anchored at Paradise Cove or China Camp before nightfall. 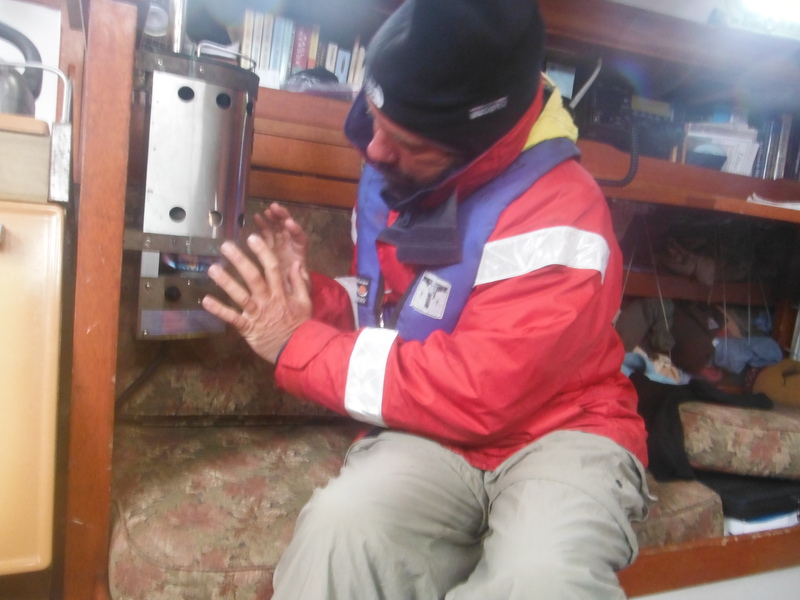 In the winters I often put Murre in a covered berth where I slowly rebuilt and readied her for more challenging waters outside the Golden Gate. In 2010 Murre and I took off. 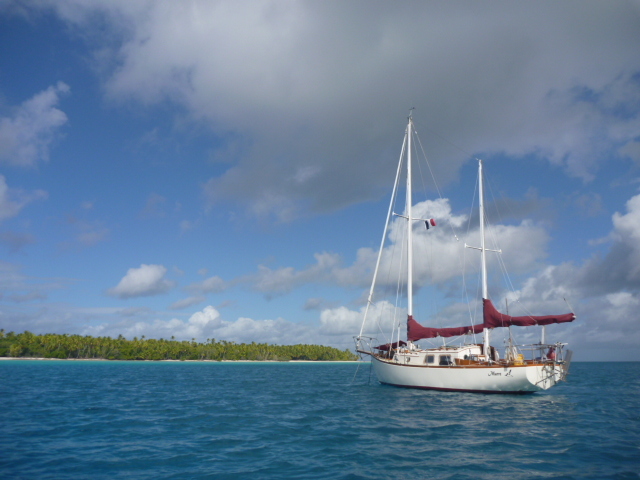 Over two years we made three long ocean passages; we explored Mexico’s Sea of Cortez, the tropical paradises of French Polynesia and Hawaii and even Alaska’s glaciers and the Inside Passage (map). 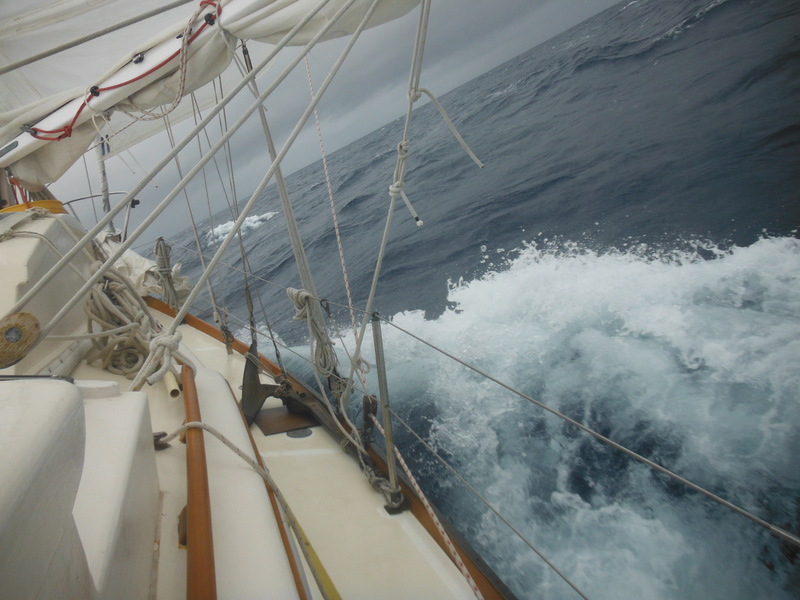 Our course covered thousands of miles of open water; we passed through the trades three times and over the equator twice; survived calms and gales; saw seabirds and dolphins and flying fishes and the vast Pacific from 20 south latitude to nearly 60 degrees north. Without doubt it was the grandest adventure I could have imagined. 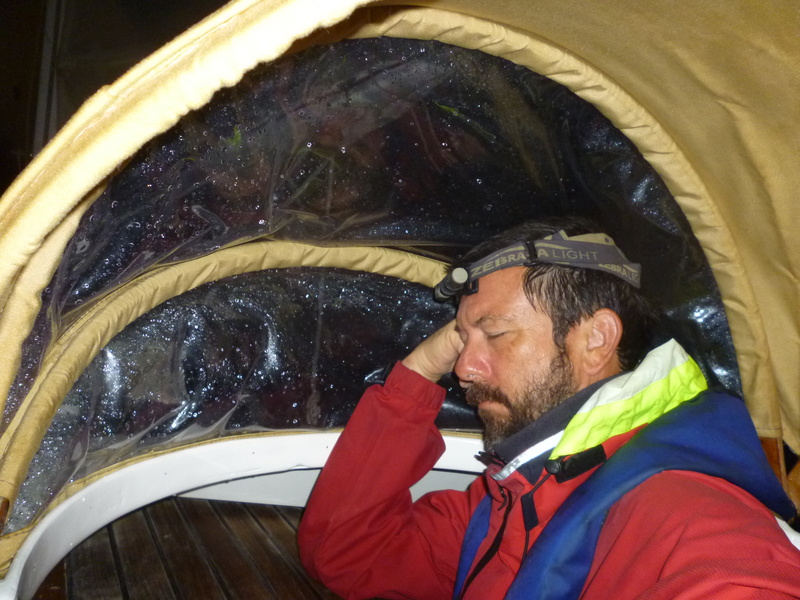 We returned under the Golden Gate late in 2012, and I’ve since been organizing a different adventure requiring a much different boat. 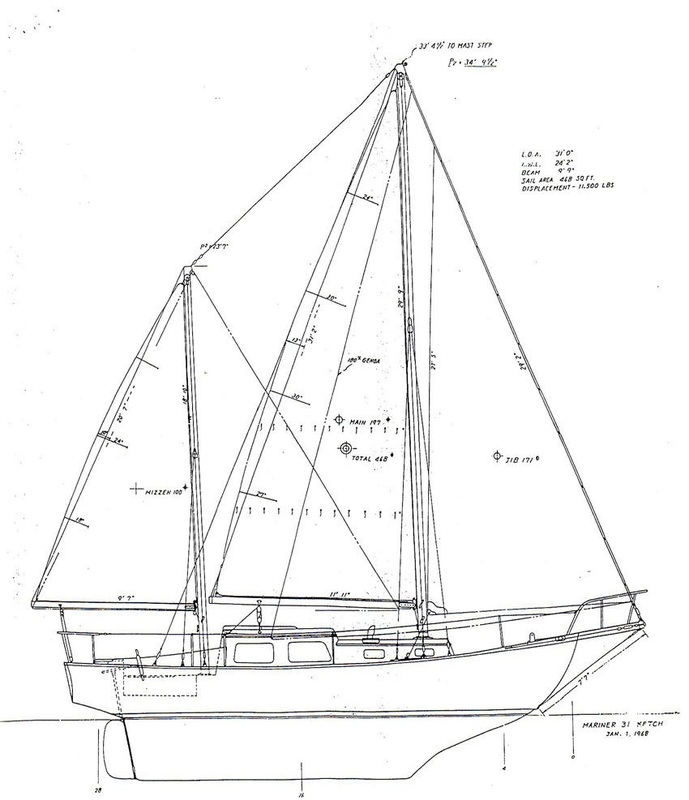 Line Drawing of the Far East Mariner 31. 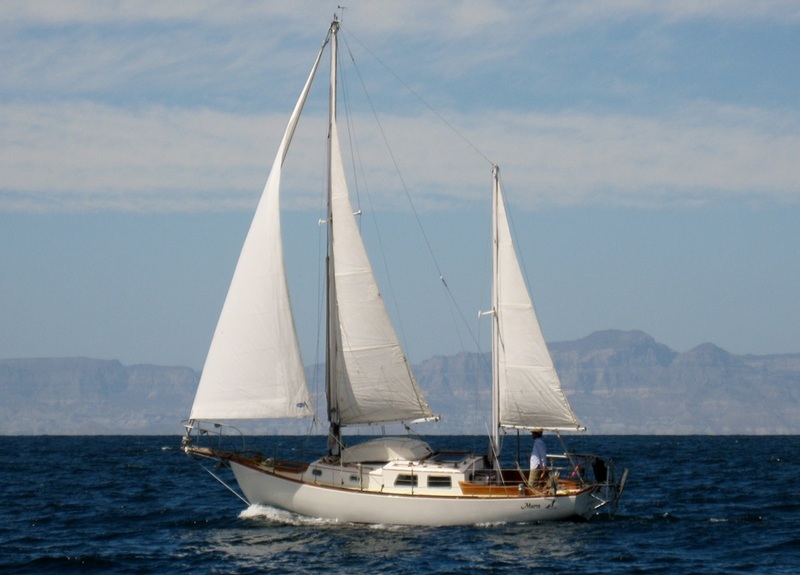 Murre is a Far East Mariner 31 built in Japan in 1972 and restored in California between 2003 and 2010. 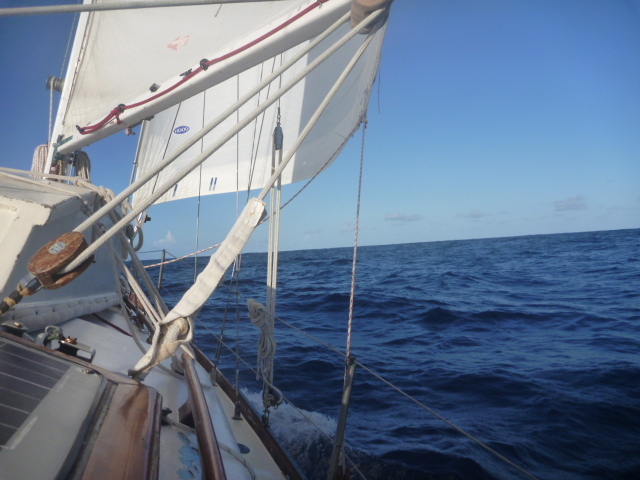 She is ketch rigged and has a full keel with cut-away forefoot and big, strong rudder controlled by a robust worm gear of bronze. 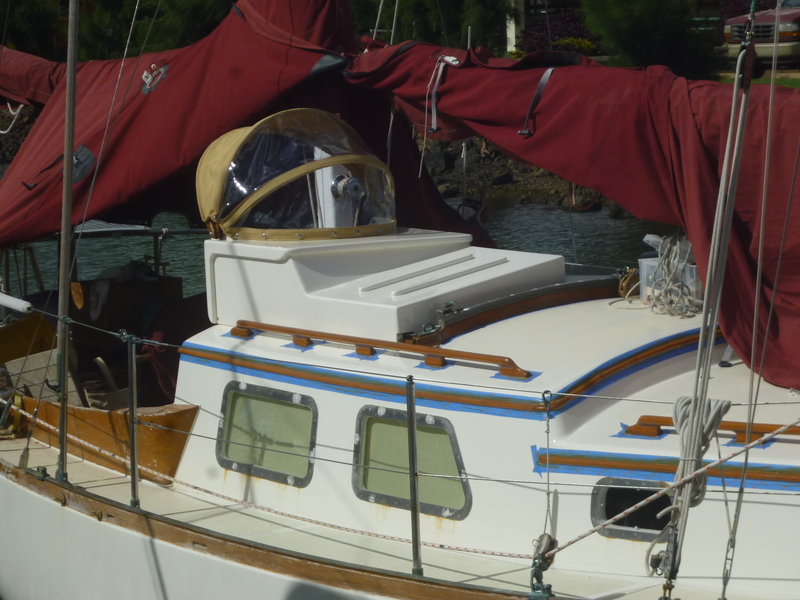 Her hull is solid fiberglass, insulated between the deck and waterline, and her ballast is encapsulated. Her deck and cabin construction is glass and wood sandwich, replaced and heavily reinforced during the rebuild. LOA: 31′ — LWL: 25′ 8″ — Beam: 9′ 9″ — Displacement: 11,500lbs — Ballast: 5,000lbs — Sail Area: 468 sq. ft. Theoretical hull speed: 6.8 knots — Displacement to Length Ratio: 300 — Ballast to Displacement Ratio: 43% — Sail Area to Displacement Ratio: 13.97 — Capsize Ratio: 1.71 — Comfort Ratio: 32.51. Murre inside Makemo Atoll, Tuamotus, French Polynesia, 2011. 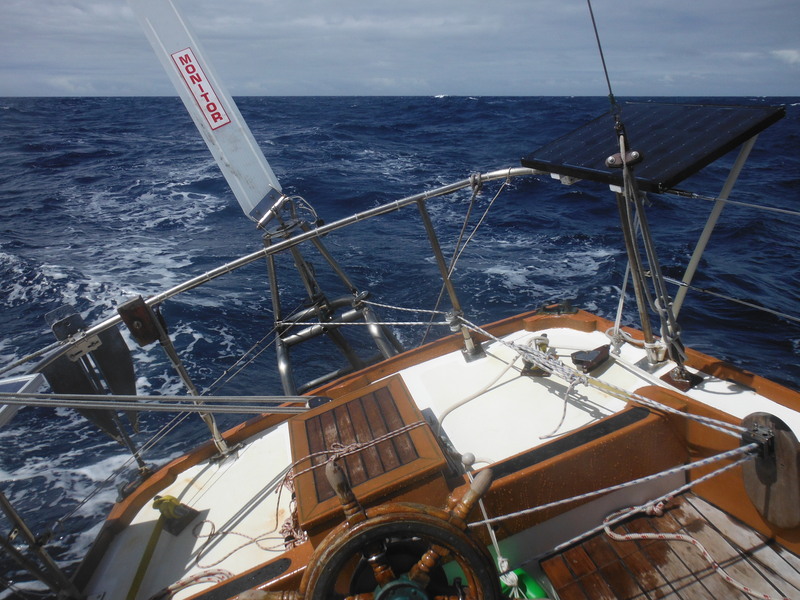 Engine: Perkins 4108 — 50hp; 70 amp alternator and new spare; Racor fuel filter; large Grocco bronze raw water strainer. Tanks: Fuel, 40 gallons in one tank (plus 20 in Jerries on a locker); Water, 60 gallons in three tanks. Electronics: Lowrance 7″ Chart Plotter (full Pacific chart cards) with HD Radar; Standard Horizon Matrix GX 2150 VHF Radio with AIS receiver; Hand Held VHF; ICOM M710 Single Sideband Radio with PTC III-USB Pactor Modem; Tactics wireless depth and knot meter. Electrical: House Bank is 3 Group 31 AGMs of 315 amphrs; separate start battery. Banks are isolated by separate Blue Sea battery switches and combined for charging with a Blue Sea Automatic Charging Relay switch. Charging is via 70 amp engine alternator and 200 watts solar power in 4 panels. 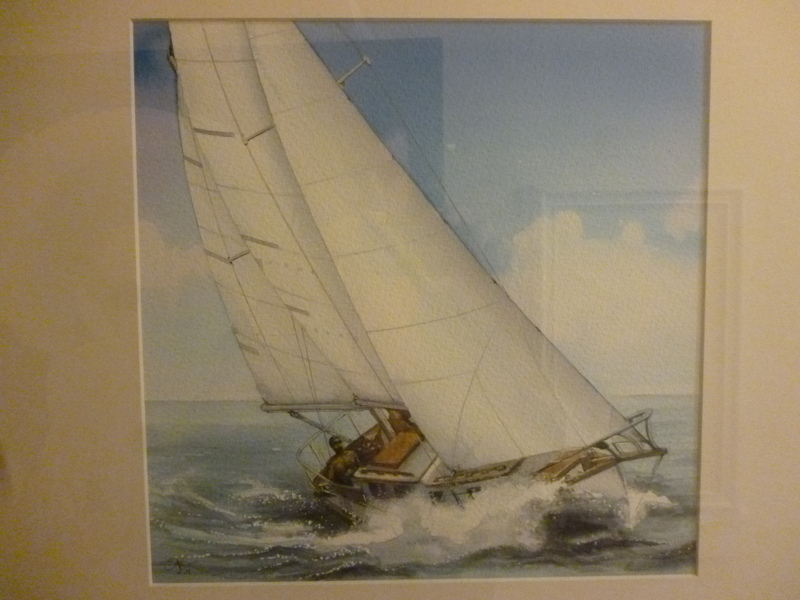 Sails: Schafer roller furling system holds a 115% Hood jib; removeable inner stay for hank on storm jib; fully battened main and mizzen; mizzen staysail, mule sail, and “racing” spinnaker. 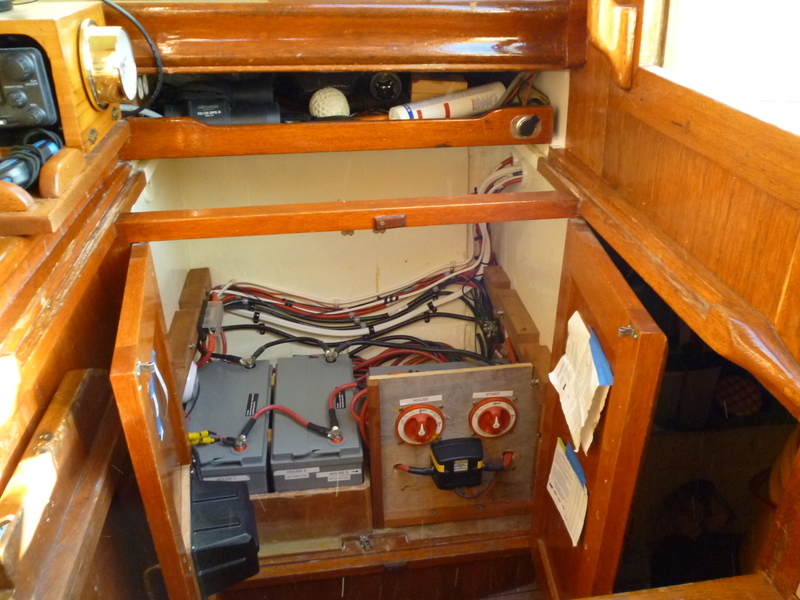 Dodger: Custom made companionway hatch cover and small dodger. 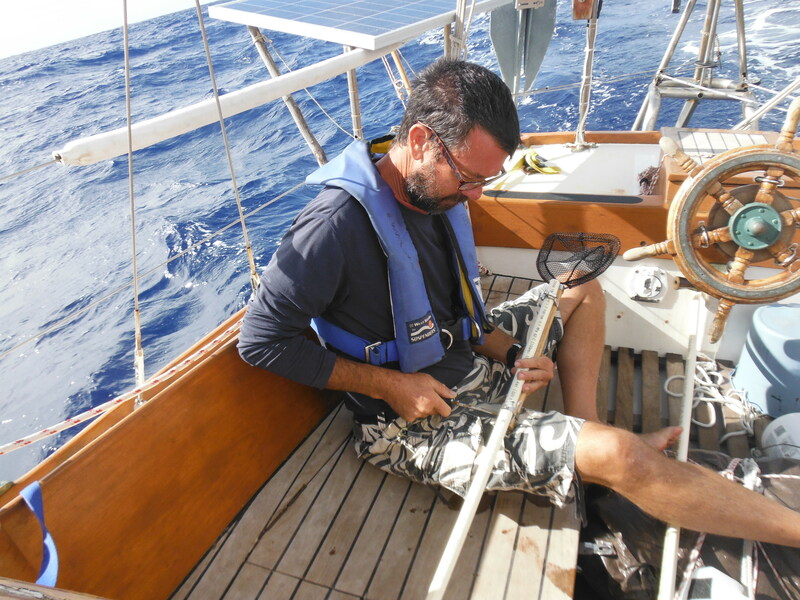 Rigging: Standing rigging beefed up and increased in size before passage making. 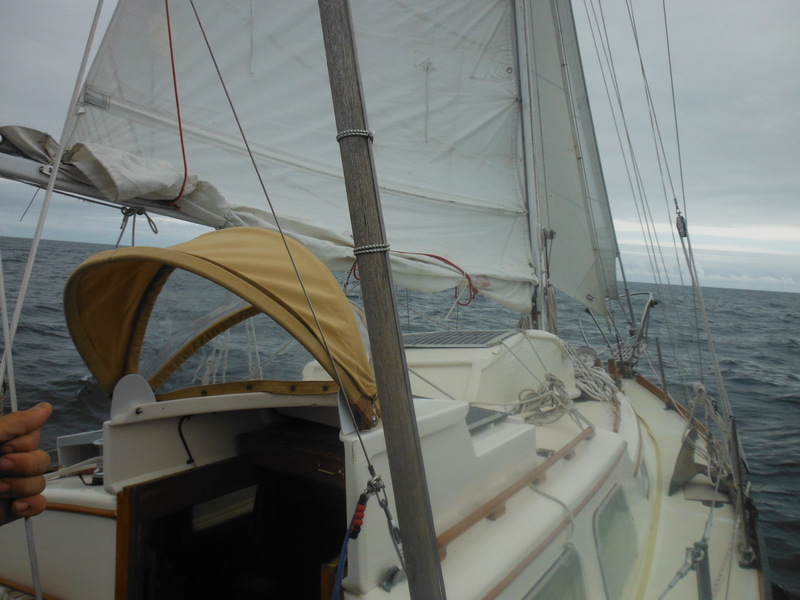 Spinnaker pole customized for downwind cruising on headsail; removable inner forestay with running backs for storm jib; running backs for mizzen. Galley: three burner propane stove and propane in two 20# tanks; single stainless steel sink with electric pump for fresh water and foot pumps for fresh and sea water; large ice box. Lighting: LED cabin lights; LED running lights. Ground Tackle: 35 lb CQR on the bow; small danforth as kedge on stern; 200 ft 5/16ths chain and 300 feet 1/2″ rode; manual windlass. Emergency: Flares, ACR Aqualink PLB; Switlik 4 person life raft. 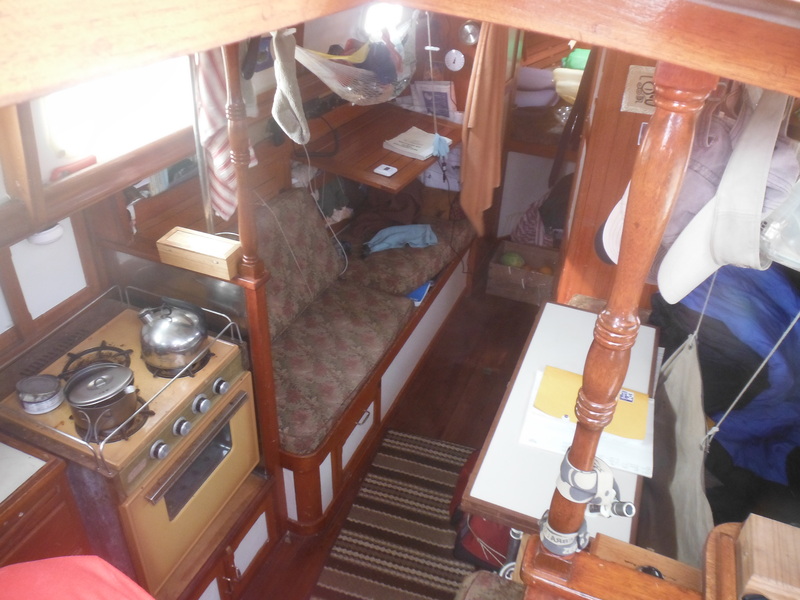 Accommodations: Galley to port of companionway; small navigation station to starboard; two settee berths in main salon and fold-out dining table. 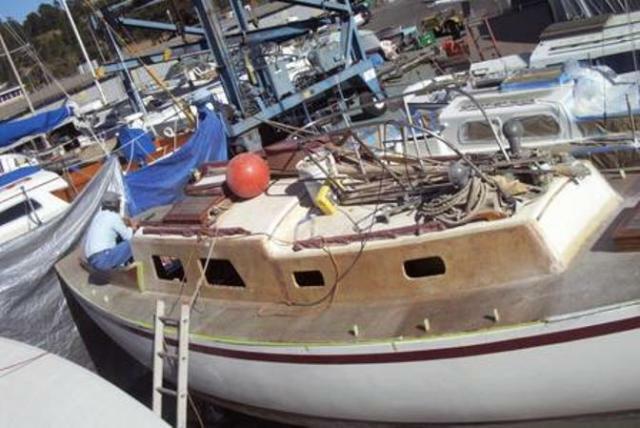 Single head forward to starboard and hanging storage locker to port; large v-berth plus ample lockers both in the boat and in the cockpit. 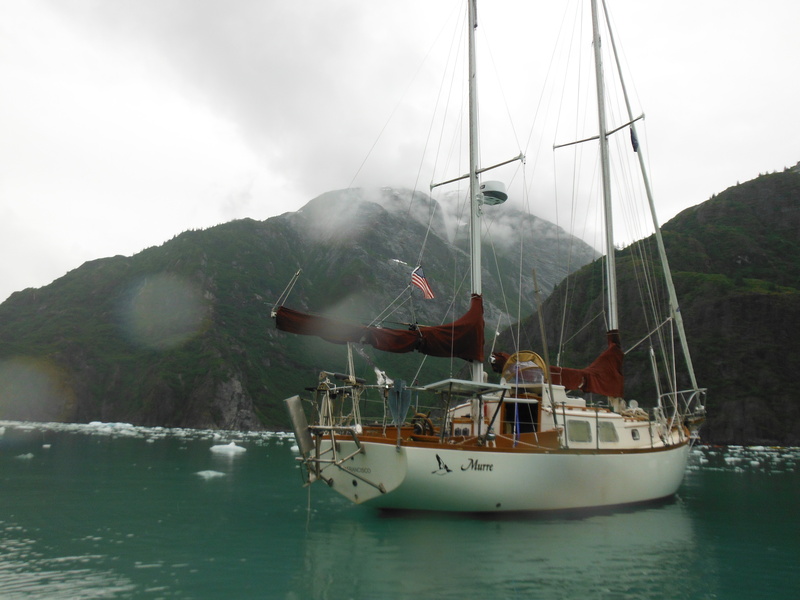 Murre exploring Sawyer Glacier inside the Tracy Arm, Alaska, 2012. 2003 — Rebuilt and reinforced deck and cabin sides; stripped all bottom paint and applied barrier coat. Read about it. 2006 — Rebuilt cockpit well, massively reinforcing floors and mizzen support; replaced fuel tank with new. Read about it here and here. 2008 — Rebuilt aft cabin bulkhead. Read about it. 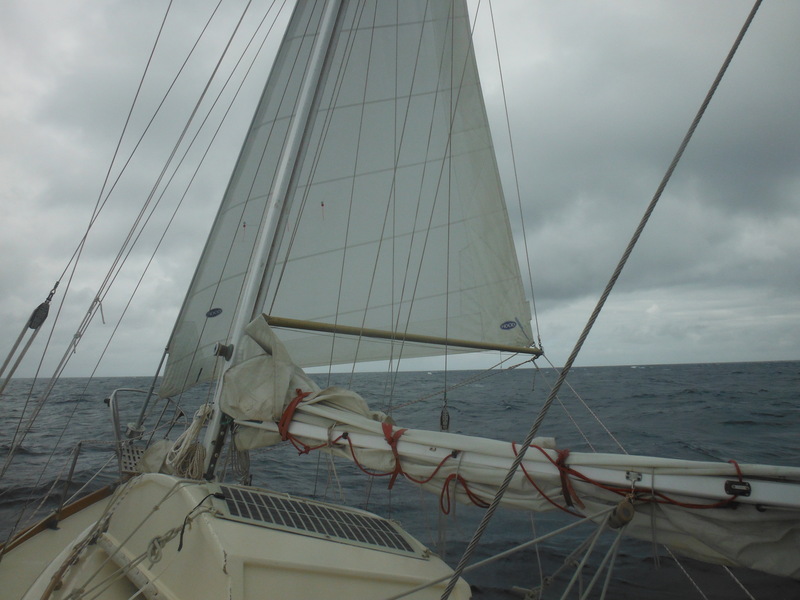 2009 — Fashioned and installed new bowsprit and spreaders. Read about it. 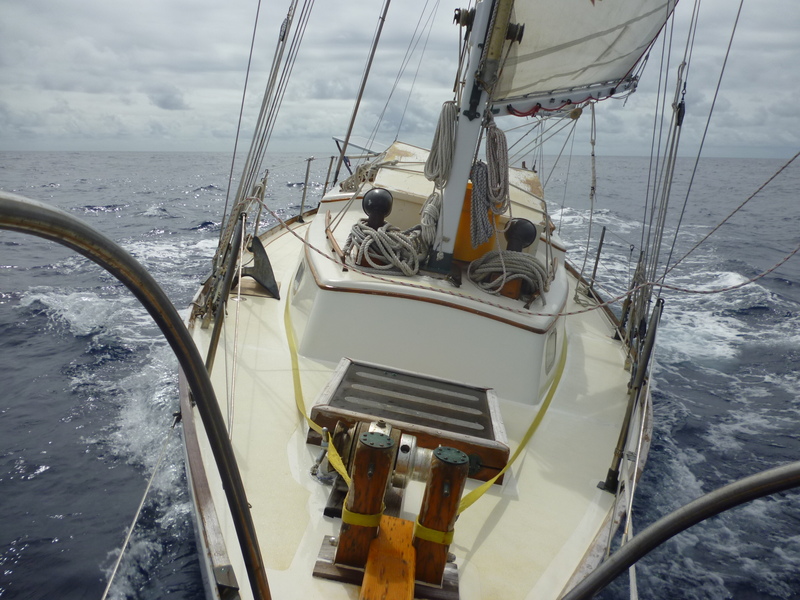 2010 — Replaced all stainless chainplates with new, nearly doubling thickness; replaced all standing rigging with new wire and turnbuckles and increased wire diameter by one size. Replaced all running rigging with new. Shot hull and decks with Awlgrip. 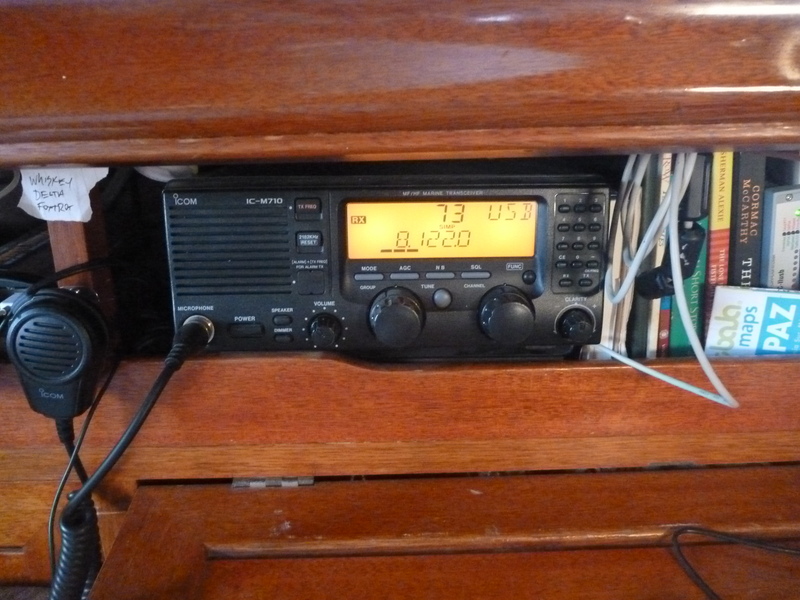 Added Tactics knot and depth meter; Garmin chart plotter; Standard Horizon VHF and AIS; Icom M710 SSB and Pactor. 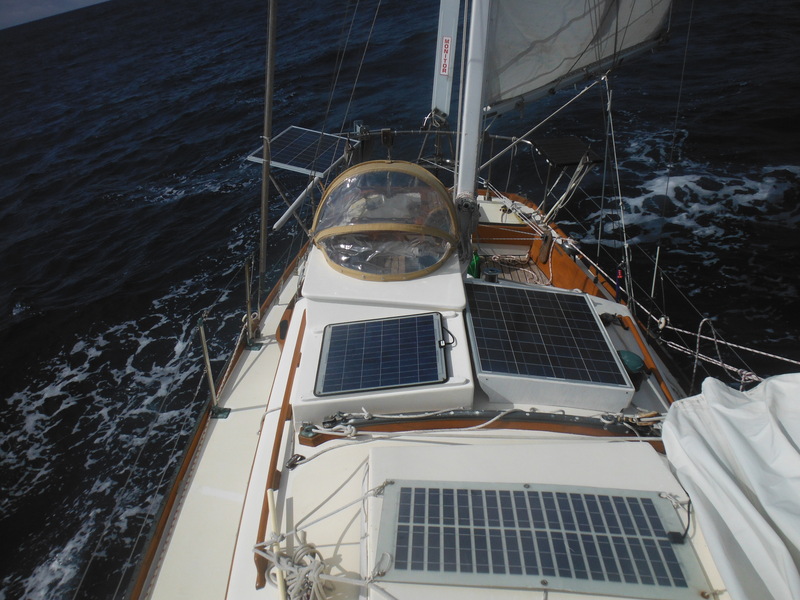 Installed solar panels; new Blue Sea electrical switches; new Blue Sea battery switches; new Blue Sea ACR and volt meter. 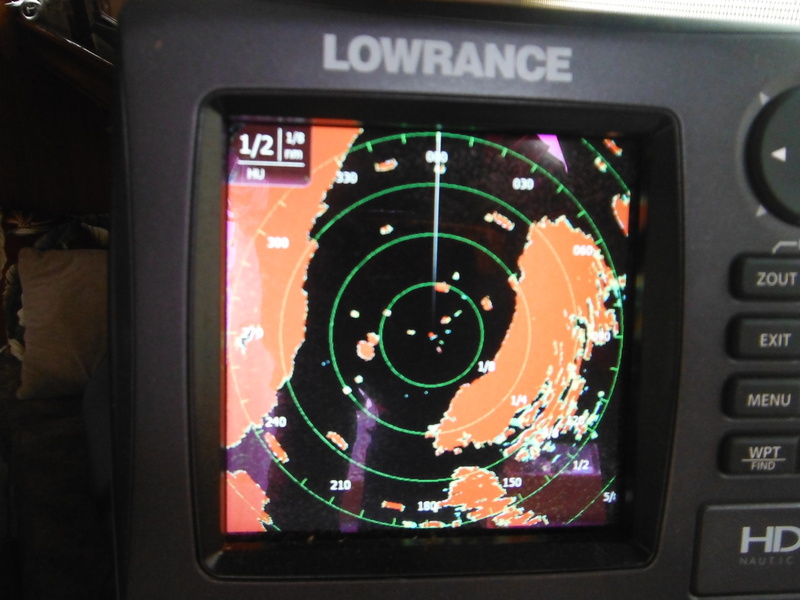 Installed Monitor windvane. Added new HOOD 115% headsail. 2011 — Replaced house bank with new 3 AGM 105s (Group 31) of 315 amphrs. 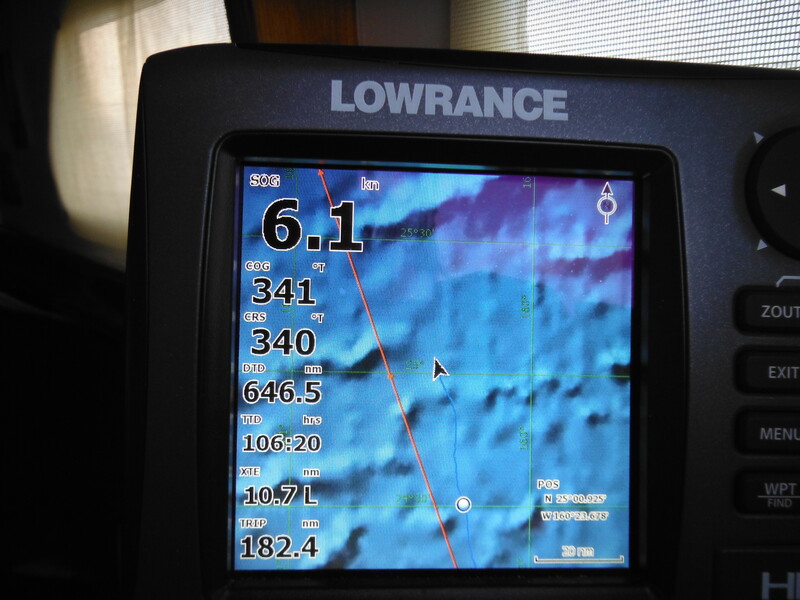 2012 — Added Lowrance 7″ Chart Plotter and HD Radar. 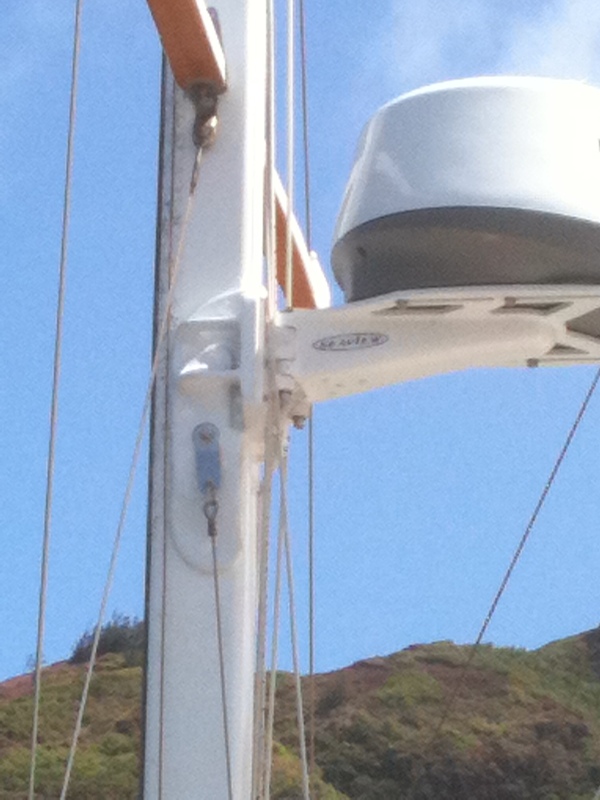 Built custom hard dodger over companionway. Added Switlik 4 person liferaft. RESOURCES: Mariner Owners website, Mariner Owners bulletin board. Painting of Murre commissioned by my wife from artist and family friend, Nick Stewart. Not included in sale, but contact me if you’d like to commission Nick for yourself. New batteries in and under load. Dodger: final result with canvas installed. Why the hood is good. Yippie, say the solar panels that now have sun to work with. Making smart time on a clear day with the Monitor. HD Radar showing bergy bit targets in Alaska’s Tracy Arm. Shroud attach point in new radar bracket.